According to the American Dental Association, oral braces are extremely common and are used to help correct malocclusions. Although these devices will straighten your smile, they can be a bit painful. Here are five dental tips that will help you alleviate the discomfort. The worst brace pain occurs during the first few days after they are applied to your teeth. During this time, it is advised to eat soft foods that do not require much chewing. For instance, fill mealtime with soups and shakes. Eating cold foods will help as well. They numb the mouth. Foods that are high in acid will create sores in your mouth. This means that it is wise to steer clear of orange juice and other citrus foods. Further irritation will be kept to a minimum. Avoid sticky or hard foods. 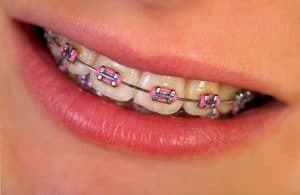 These can damage your braces, which will lead to more pain. Besides taffy, chips, and nuts, you should avoid chewing on pens and other hard objects. Most over-the-counter pain relievers can be taken to limit brace pain. For example, acetaminophen or ibuprofen usually work quickly, but they should be taken on a full stomach. Rubbing an anesthetic over your cheeks and gums will keep brace pain down. It provides a numbness that remains for hours. Saltwater has soothing properties and is often used to treat mouth sores, especially on the cheeks. For relief, simply rinse with a saltwater solution for a minute at a time. Dental wax is usually given by your orthodontist. It is used as a wall between the metal braces and your mouth. No one wants to be in pain from oral braces. The above ideas should keep your discomfort to a minimum. For more dental tips, consult with Dr. Dana Walters. He is always available to address your dental concerns.